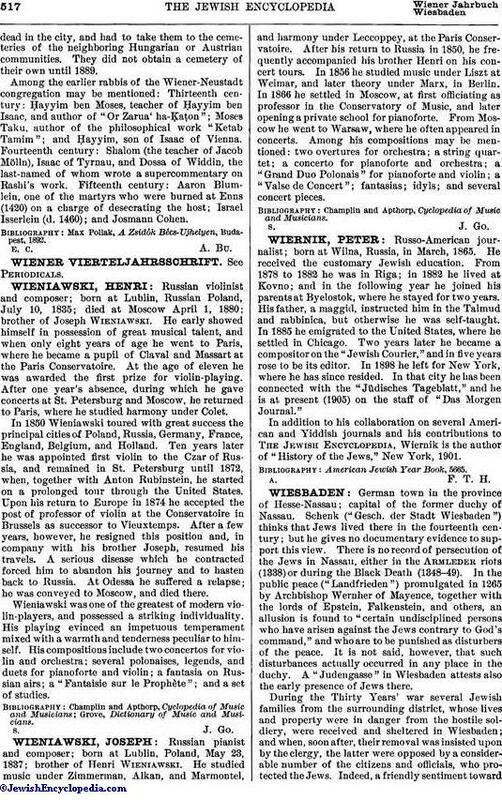 Russian pianist and composer; born at Lublin, Poland, May 23, 1837; brother of Henri Wieniawski. He studied music under Zimmerman, Alkan, and Marmontel, and harmony under Leccoppey, at the Paris Conservatoire. After his return to Russia in 1850, he frequently accompanied his brother Henri on his concert tours. In 1856 he studied music under Liszt at Weimar, and later theory under Marx, in Berlin. In 1866 he settled in Moscow, at first officiating as professor in the Conservatory of Music, and later opening a private school for pianoforte. From Moscow he went to Warsaw, where he often appeared in concerts. Among his compositions may be mentioned: two overtures for orchestra; a string quartet; a concerto for pianoforte and orchestra; a "Grand Duo Polonais" for pianoforte and violin; a "Valse de Concert"; fantasias; idyls; and several concert pieces. Champlin and Apthorp, Cyclopedia of Music and Musicians.